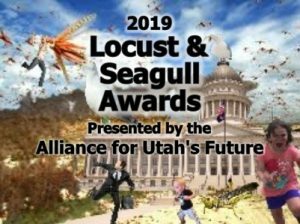 Published November 9, 2018 Filed under Family, Uncategorized. Total of no comments in the discussion. November 10 – 461 Leo the Great, Bishop of Rome, Teacher of the Faith. 1688 Edinburgh. 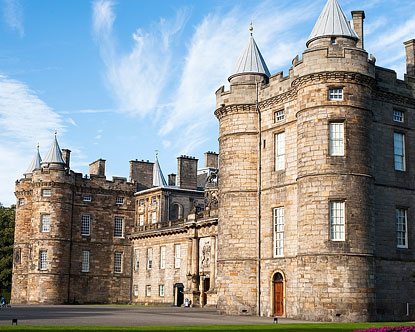 Holyrood House, The whole furniture of the Palace chapel; and, finally, forcing their way into the royal sepulchres, and pulling about the bodies of the deceased princes and kings of Scotland. These monuments, to the great scandal of the British Government, were not closed until circa 1818. 1700 The Darien colony. Americas. Sometime in November. King William II (of Scotland), remained indifferent to all complaints of hardship and petitions of redress, unless when he showed himself irritated by the importunity of the supplicants, and hurt at being obliged to evade what it was impossible for him, with the least semblance of justice, to refuse. The motives of a Prince, naturally just and equitable, and who, himself the President of a great trading nation, knew well the injustice which he was committing, [Sir Walter Scott’s Tales of a Grandfather-59-48] seem to have been, first, a reluctance to disoblige the King of Spain, but, secondly, and in a much greater degree, what William (King William III of England), might esteem the political necessity of sacrificing the interests of Scotland to the jealousy of England, a jealousy equally unworthy and impolitic. But what is unjust can never be in a true sense necessary, and the sacrifice of principle to circumstances will, in every sense, and in all cases, be found as unwise as it is unworthy. 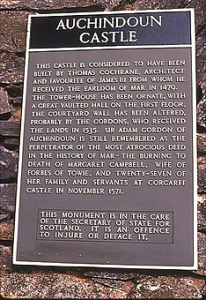 The collapse of the Darien Venture in April 1700 played a part in the signing of the Act of Union in 1707. Nothing was believed to exist of the National Address, which appealed to King William to lift a ban on English colonies trading with the Scots. Blair Kerr found the Angus and Dundee section while researching for a degree. 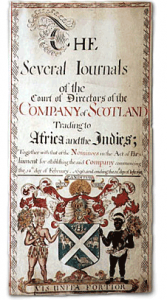 The National Address was organized as the second of the Company of Scotland’s two expeditions to the Isthmus of Panama to establish the trading colony which began to founder in 1699. Names were gathered in districts across Scotland. 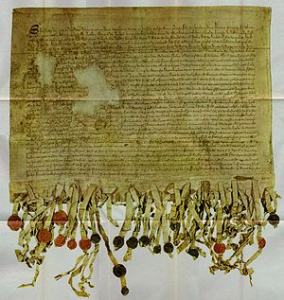 Mr Kerr found the part relating to Angus and Dundee while researching opposition in Scotland to the Darien scheme for his Masters of Research degree at the University of Stirling two years ago but has only now made his discovery public. 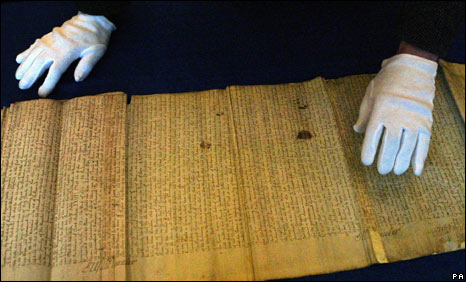 The single sheet of paper has signatures gathered by the Earl of Panmure, a leading Jacobite and a member of the Company of Scotland. “This is the only part of the National Address to have turned up in more than 300 years. “For years historians have been speculating what was contained in the National Address.” He added: “I was researching opposition to the Darien Venture. It was considered unpatriotic not to support it, but there were people saying: ‘you shouldn’t go’.” The Angus and Dundee page provides a list of more than 350 names – many of them considered at the time to be “men of note and consideration”. Dundee Town Council refused to sign the National Address, but those behind the petition appeared to have then encouraged Dundonians to put their names to it to help swell the number of signatures. 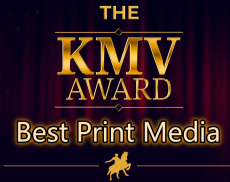 The town council had given £100 towards the £400,000 cost of the venture. But Mr Kerr said councillors may have declined to sign the petition to avoid offending King William. The National Address in its entirety would have run to several pages and contained about 10,000 names. Its plea was rejected by the king and his government. English colonies in America were ordered not to trade with the Scots in Darien amid concerns Darien would become a rival in the trade of spices and slaves. William Paterson, a wealthy businessman from Dumfries, was a leading light and a driving force behind the Company of Scotland which was set up to establish the trading post and revive Scotland’s ailing economy. 1715 – General Willis, who commanded in Cheshire, England, for King George, quartered in the neighbouring counties, appointing them to rendez vous at Warrington bridge (71-375), Jacobite rising. 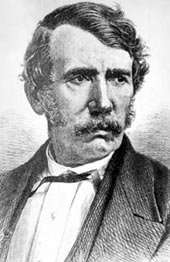 DAVID LIVINGSTONE Missionary and Explorer (1813–1873) (clan Levinstone) In 1841 Livingstone joined a Christian mission station in Botswana, South Africa. In 1853, David began his first expedition for new trade routes through Africa, returning to Britain in 1856 a hero. His second expedition, up the Zambezi River, was a disaster; his wife and others died and the expedition collapsed in 1864. 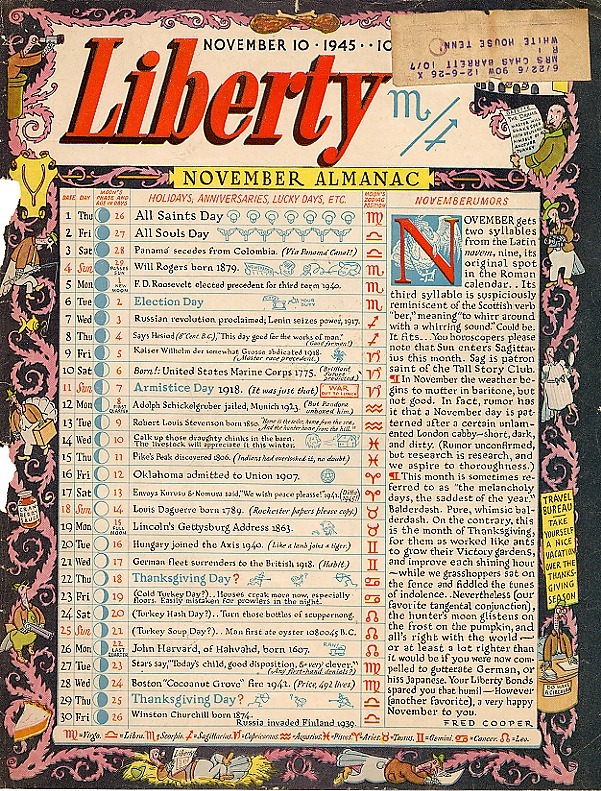 1945 Liberty Magazine Almanac cover features Robert Louis Stevenson’s birthday on the 13th. Oklahoma admitted to the union on the 16th of November 1907, with Scots names including Albany, Alex, Alva, Armstrong, Blair, Boswell, Boyd, Burns, Cache, Cameron, Carleton, Carnegie, Castle, Chisholm Trail, Crawford, Davidson, Douglas, Drummond, Dunbar, Duncan, Dundee, Featherstone, Fort Arbuckle, Fort Gibson, Gibbon, Glencoe, Glenpool, Graham, Grant, Guthrie, Harris, Hunter, Lamont, Logan, Macomb, Maud, McAlester, McBride, McClure, McClain, McCurtain, McIntosh, McKey, McKnight, McLoud, McWillie, Midlothian, Morris, Morrison, Newcastle, Newkirk, Ralston, Stuart, Taft, Temple, Wilson. Winston Churchill born 30th of November 1876 (clan Montgomery) birthday featured in the Liberty Almanac cover. 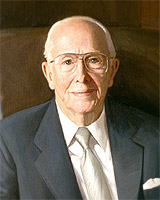 1985 Ezra Taft Benson becomes 13th President of the Church of Jesus Christ of Latter-Day Saints, Salt Lake City Utah. (1899-1994) A younger Benson served a mission to Great Britain. From 1953 to 1961, Benson was Secretary of Agriculture in the cabinet of U. S. President Dwight D. Eisenhower. He loved the Book of Mormon. (clans Bruce, Buchan, Carrick, Cheney, Comyn, Douglas, Dunbar, Giffard, Lindsay, Mar, Montgomery, Stewart, and Malcolm III Ceannmor King of Scots, http://etb.bensonfamily.org/etb-anc/surnames.htm ) Ezra Taft Benson. US Senate Resolution 155 of 10 November 1997 states that the Scottish Declaration of Arbroath, was signed on April 6, 1320 and the American Declaration of Independence was modeled on that inspirational document. “Congressional Record Senate Articles”. www.congress.gov. Retrieved 2016-01-15. The ‘Tyninghame’ copy of the Declaration from 1320 AD. 2015 Benedict Cumberbatch has been honored by Queen Elizabeth II (November 10 2015) at Buckingham Palace for his services to the performing arts and to charity. Benedict received his Commander of the British Empire award. The “Sherlock” star, was also nominated for an Oscar for best actor for his portrayal of computer scientist Alan Turing in “The Imitation Game.” Besides the fictional Scots sleuth Sherlock, Benedict is maried to Sophie Irene Hunter, born March 16 1978. Granddaughter of General Sir James Michael Gow GCB died (3 June 1924 – 26 March 2013) was a British Army officer, commissioned into the Scots Guards, Commanding Officer of 2nd Battalion Scots Guards in 1964, Commander of 4th Guards Brigade in 1967, General Officer Commanding Scotland and Governor of Edinburgh Castle . 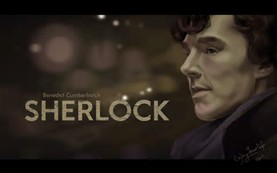 Sherlock poster on BBC. 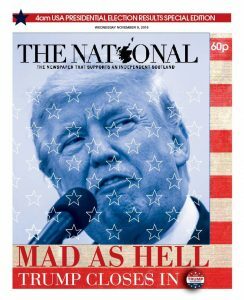 2016 Scotland’s papers circulate to Europe and around the Atlantic.